Complete Learning Management for your Employees, Partners, and Customers. 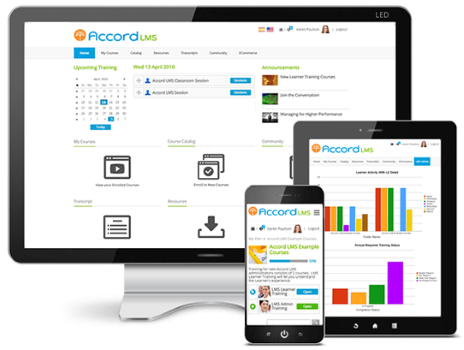 Whether you’re a small business or a multinational enterprise, the Accord Learning Management System will increase training compliance, improve consistency and reduce your costs. Schedule a demo of this simple e-learning management system or try it right now to see firsthand what we can bring to your training program. Why Choose the Accord LMS? Simple Learner Experience. Quick access to learning resources. Smart Administrative Tools. Organize learning, automate learner assignments and customize report delivery. Affordable Pricing. Only pay for Active Learners. 1000 Learners for $0.75 per user/month. Includes all you need and easy upgrades. Grow without getting penalized. Custom layout and branding options to support your learning process. Additional portals and enterprise functionality are ready when you are. Whether you have regulatory or certification requirements, need to reduce turnover or increase safety, Accord can provide a Learning Solution for your Industry. Automated Role and Profile based enrollment. Unlimited Teams, Multi-Tenant. Private and secure cloud based or on premises. Enterprise Features are included at no extra cost. Your success is our success. Customer Satisfaction is job one for Accord. Join more than a million users worldwide and find out why. You can count on us. First, the Accord LMS didn’t require us to change the way we work in order to train our employees. Second, Accord gave us the kind of reporting we wanted that others didn’t, and it is reasonably priced.